These are the BeltLine Beasties. From left to right, you'll find a sea creature in blue tones, a "big cat" in reds, oranges and yellows and a fuzzy, striped caterpiller in purples, grays and pinks. 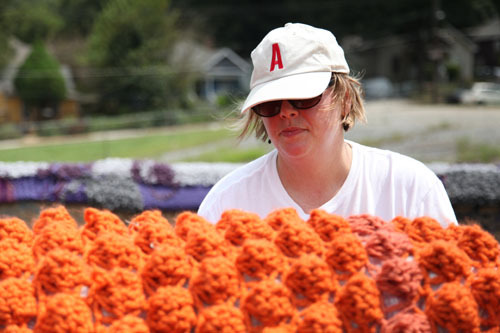 Knitterati member, Sandy Tyler explains their thought process, "Since last year's installation was more organic, we wanted to cover and soften something more industrial. We looked at fences and bridges and settled on a bridge spanning Sasseen Street in Reynoldstown." 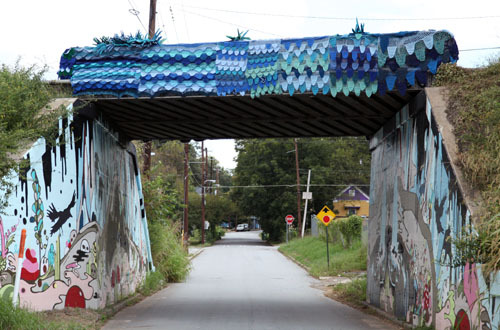 Sandy, "There's a lot of mythology about crossing bridges and references in fairy tales, and this led us to want to create creatures for our section of the BeltLine." If you live in intown Atlanta, you probably care quite a bit about the BeltLine, which someday will encompass a 22 mile loop around Atlanta. This extensive restorative project will include rail, trail, greenspace, housing and art. As stated on their site, "It will ultimately connect 45 intown neighborhoods." Adding, "It offers a chance for Atlanta to redefine what it is to be a neighbor, to be a community, to be a region, and to share all that it has to offer." The project will take two decades to complete but progress seems to be made every day. Three trail segments are open or nearly so and there are also four new or renovated parks. And the parts that are open, have temporary public art exhibitions that highlight musicians, visual artists and performers... it's really wonderful. 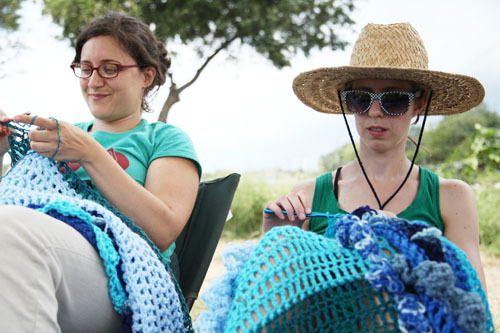 So this past Saturday, I jumped at the chance to see Sandy and her fellow Knitterati transform a stark, cold bridge into a vivid, intriguing world I'd like to inhabit. Sandy, "There is a different view from the top of the bridge as well as from each side, so we hope visitors will take a few minutes to walk under the bridge and see the sea creature and caterpillar from the ground as well as from the BeltLine above." 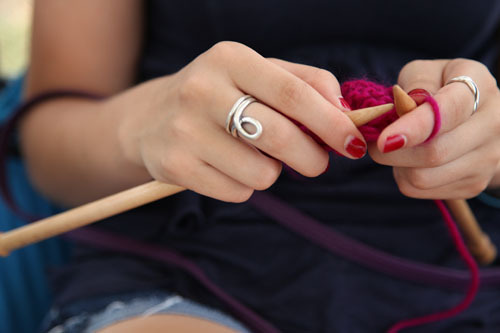 A big congratulations to The Knitterati. 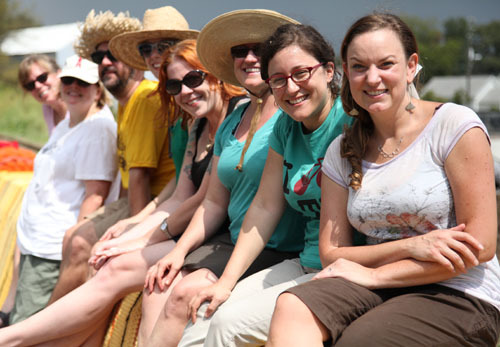 From left to right, Julie Rivard, Sandy M. Tyler, Britt Dunn, Katherine Kearns, Kate Crosby, Brigette Flood, Stephanie Hass, Kate Swett. (Annie Perry and Kate Binzen not pictured) So now that that's done, what's next?